Ryan Ridge’s Hunters & Gamblers is a pure blast (of cocaine—what?! No!). It’s smart, funny, and entertaining. It’s blasting smartfuntainment and more. This collection of short fiction, featuring the novella Holiest of Holies, had me feeling super fine from start to finish. Ridge combines intelligence and playfulness like a mad chemist, and the concoctions explode in great and surprising ways. “I opened the front door to find a little girl in a green-striped smock, holding a bullwhip and a box of cookies. ‘Cookies?’ she said, and cracked her whip. The final third of the book bends like a collective nostalgia of re-written histories, marriage, and tabloid tales. 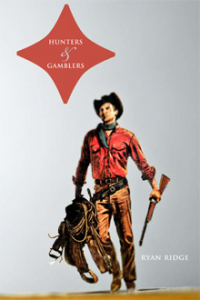 Purchase Hunters & Gamblers HERE.